Footfall Intelligence Solution from VTA. VTA Corporation continuously innovates, designs and provides Footfall/Passenger counting/Retail Intelligence services to assist our customers in making strategic management decisions resulting in enhanced efficiency, customer service levels, revenue, and improved profitability.  Effective evaluation of advertising and promotions.  Accurate evaluation of trading hours and staff scheduling.  Ability to track staff training effectiveness and their performance.  Monitor and compare current vs. historic data of multiple business locations.  Evaluate influence of tenant change and impact in shopping malls.  Ensure compliance with safety regulations and crowd control in malls/public or private facility.  Customer flow analysis is the key to commercial success and maximizing investment returns. important insight needed to make critical business or management decisions. People counting provides a wealth of usable metrics, allowing management extracting insights and ability to see a clear and detailed picture of visitors' and customers' behavior. Management decisions are therefore made with real-time, accurate, and relevant information. VTA helps to keep track with the traffic patterns throughout the year, be it daily, weekly, monthly, quarterly, or half-yearly. Knowing the traffic patterns for the whole time gives insights on seasonal fluctuation and other behaviors, much of which managers have only been guessing until now. Impact of marketing activity can also be monitored and analyzed with VTA by comparing people traffic of different days of the week. By understanding traffic patterns and available information, marketing efforts can be optimised. 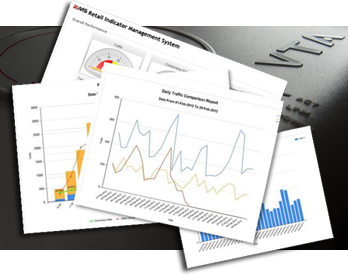 VTA-RIMS, “Retail Indicators Monitoring System” centralized real-time and user-friendly retail’s business intelligent software tool combines with retail performance dashboard (Footfall, sales data, service level, store-front attraction, etc.) that provides performance based metrics, viewable in multiple ways and across different verticals even if you are on a move. VTA-RIMS, Retail live on-line monitoring tool “gives you far more information with minimum effort and helps retailers maximize the uncover opportunities.